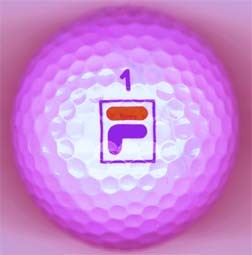 This proprietary four color logo golf balls has two logos imprinted on the purple color golf balls. You only need to pay one time, six imprinting pad charge and 6-time logo imprinting charge / per ball. Two sides, 4 color logos. Front side 4 imprinting pad needed. one pad to print: "blue" color part. one pad to print: the "red" color part. one pad to print: the "green". Back side 2 imprinting pad needed. Total imprinting job needed: 6 times . Font side needs to print "blue", "red", "yellow" and "green" parts equal to 4 imprinting jobs needed. Back side needs to print "blue" and "red" color parts equal to 2 imprinting jobs needed. What's the best size of logo, for logo imprinting ? + the one time set up charge of six pads. 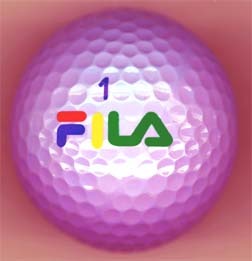 300 balls - minimum order required for each different type of logo golf balls. All the above brand names belong to their respective trade marks.